Smoothies are simple and delicious. 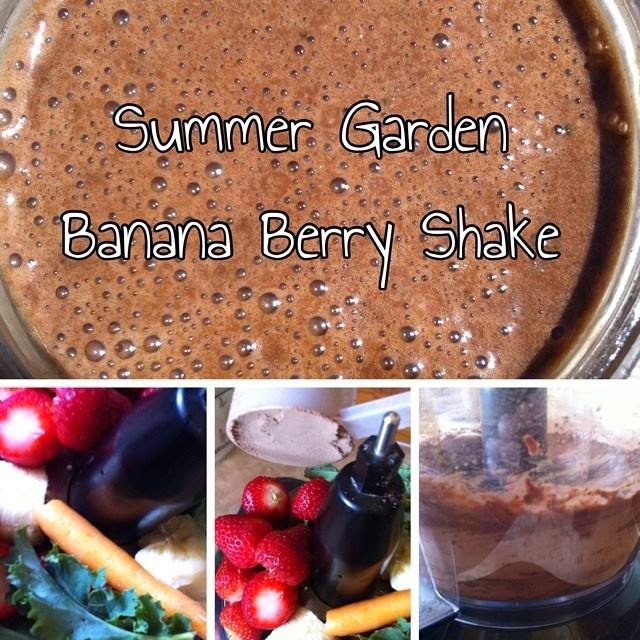 I make them everyday and add my Shakeology supplement to my smoothie, this is how I begin my morning. The key to making a good smoothie is 2 parts veggies, 3 parts fruit and ice. I don't own a blender so I'm often making them with my food processor and you can't grind ice in a food processor, nor can I add liquids. How do I get around these problems? I add my almond milk (or coconut milk) and any additional juices or water afterwards and simply stir it in. That works wonderfully, but you generally need ice to make a smoothie thick. I freeze my bananas and Greek yogurt instead. Sometimes, I add homemade frozen pumpkin puree and I defrost it halfway and then throw that in with the mix. As long as it isn't frozen solid you should be able to break it up with the food processor. I love gardening and I frequently harvest spinach, kale and carrots for smoothies throughout the week. Spinach grows easily in small spaces so consider growing a few small plants on your windowsill, somewhere out of direct sunlight. Spinach doesn't like the hot summer heat, so providing your spinach plant with a cool, shaded location will be your key to fresh spinach all summer long. Of course, if you are not a Shakeology drinker, you can add your favorite supplemental powder or protein powder and adjust the recipe as necessary. You can even omit it completely! I know for a fact this tastes great with the chocolate Shakeology though. Not sweet enough for you? Add a couple drops of liquid Stevia or honey to sweeten your shake. Have you entered the Silk Summer of Smoothies Sweepstakes on Facebook? The giveaway ends July 27th and you can win a Vitamix Blender, a $350 Visa gift card, a Silk Tumbler, 8 Silk Coupons and a 5 recipe card. The giveaway is open to Canadians only! Disclaimer: This post was sponsored by Silk Canada and I received this opportunity via Tap Influence. This is a sponsored conversation written by me on behalf of Silk. The opinions and text are all mine. This year, I grew a bunch of onions. In fact, the onion every other vegetable ratio is a little askew. 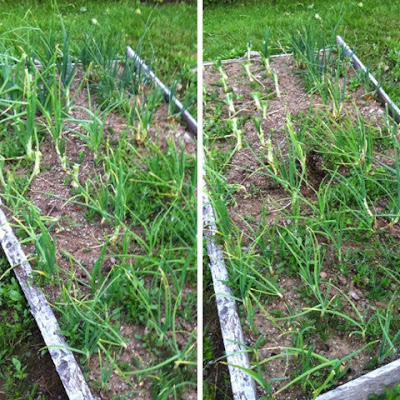 I grew 2 different varieties of onion as well. I grew red onion shallots, yellow onion shallots and onion multipliers. I'm constantly cutting back the greens. I use some every day in cooking and I give some away to friends whenever they drop in. It is at the point where I need to harvest a bunch of greens so they don't go to waste and there is no way I can use them up quickly enough. It's time to freeze the greens. I filled up a large container with some greens I had cut back. As you can see I barely made a dent, you can also see that I need to get out there and do some weeding. Don't mind the empty spaces, I pulled the odd plant out as needed. Most of them will mature into full grown onions though. Washing the green onions in a solution of vinegar and water, to free them from dirt and other bugs that may have been carried inside. After the veggies have been washed, dice them and place them on a baking sheet or parchment paper on a baking sheet and lay them in the freezer for a couple hours or until half frozen. 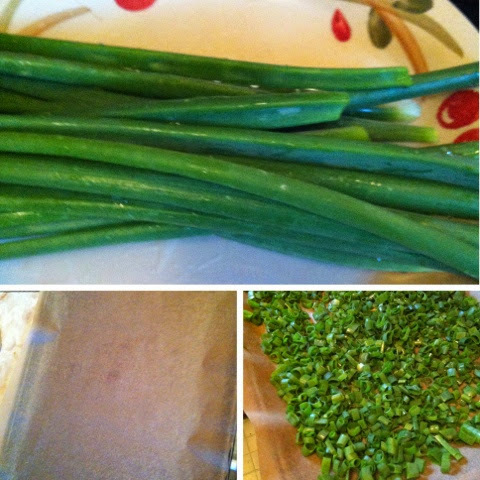 Afterwards, place the green onions inside a freezer bag. Don't forget to mark the date that they were prepared and frozen on the bag. Have any other tips for freezing green onions? Do you do something differently? Please feel free to share your thoughts and advice in the comments below. 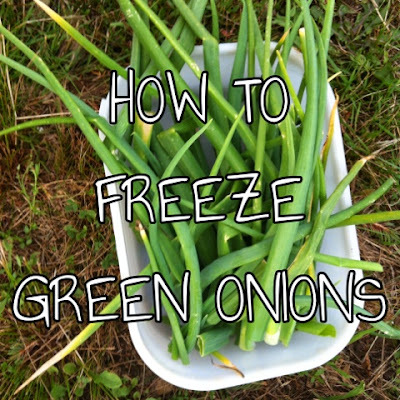 Tip: Onions soften after they have thawed, so they are best used in dishes that require cooked onions. I LOVE TEA!! There I said it. I have a tea cupboard in my kitchen. I try to keep it stocked. By stocked, I mean the entire cupboard should be stuffed with a large variety of tea. I start to panic when I get low on supply. Low on supply for me is probably way more tea than a normal person has in their cupboard. I like to an assortment of organic teas on hand to offer company and really, there is a tea for every person, for every mood, for every season. 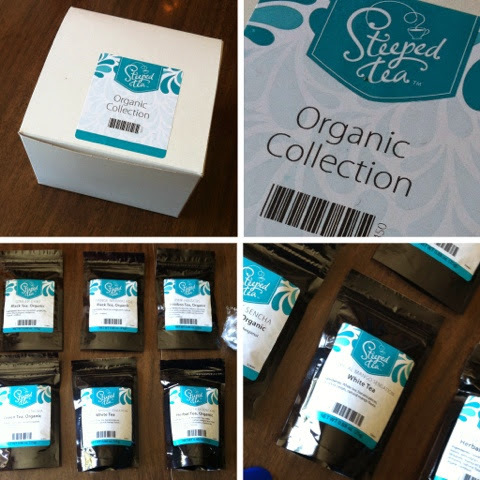 Christa Jones is an independent consultant for Steeped Tea. She sent me her Organic Tea Collection, which comes with 6 different teas, a tiny spoon and small round tea infuser. Each package is marked with brewing instructions and steep times. Tropical Mango Sensation - White Tea: This was the first one I tried, I love tropical fruit. I enjoyed the banana and mango pieces. The tea was sweet on its own so I didn't need any sweetener. The tea was very pleasant. Bergamot Sencha - Green Tea, Organic: This green tea had the full bodied flavor of green tea tips with a light dash of Bergamot for a nice uplifting aroma. This is a perfect afternoon tea. Green tea is an antioxidant and it can help boost your metabolism. I never used to like it growing up because the taste of the leaves can be strong and acquired. I find I'm enjoying it more as I age, the last couple years especially. I love this blend and the essence of bergamot, this tea would be perfect for winter or a rainy day when you need your spirits raised. Nettle Greek Mountain - Herbal Tea, Organic: This is a perfect afternoon tea. It smells so good. My friend Steffie and I had some out in the garden yesterday. It strongly appealed to both of us. I really enjoy the blend and it is definitely a tea I could see myself drinking regularly when I need a nice moment of me time. Ginger Chai - Black Tea, Organic: This tea smells and tastes amazing, I'm a fan of Ginger and I love Chai Tea so I was quite excited when I pulled this tea out of the box, the ginger intermingles with the Chai beautifully. Orange Marmalade - Black Tea, Organic: This tea is divine. It is the perfect breakfast tea with a hint of citrus. I really enjoy this blend. In fact, as I write this I'm drinking a cup. Pink Hibiscus - Rooibos Tea, Organic: Rooibos tea isn't generally my favorite type of tea. It is very earthy, I love the smell of the Pink Hibiscus a great deal, in fact, its scent currently dominates a body wash I am currently using. Rooibos still isn't my favorite but this blend is more enjoyable than previous blends. 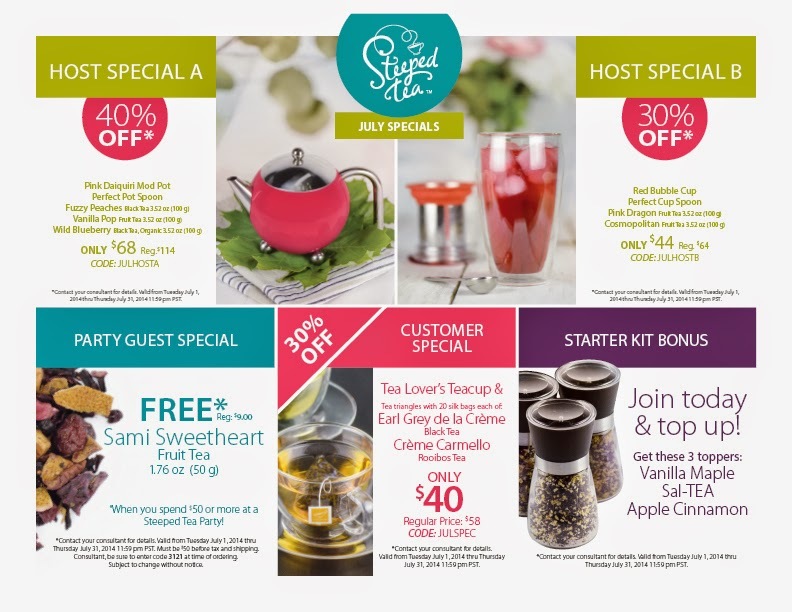 You may also join our Facebook Online Tea Party event and invite your friends. Christa has offered the same Organic Tea Collection that I have reviewed to one lucky Canadian reader. The value is approximately $35. 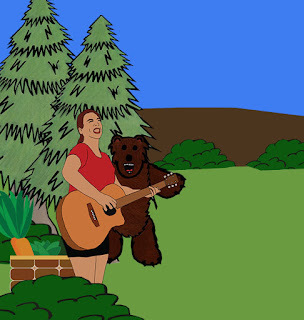 You can enter via the Rafflecopter form below. Good Luck everyone!